Hi-res PixeLINK firewire camera in stainless steel enclosure. Large diameter Spectrum Illumination infrared LED ringlight lights the roll without distracting line operators. A camera/ringlight set are mounted each side of the paper roll line. Norske Skog is a world leading producer of paper for newsprint and magazines, with 22 paper mills around the world. The Tasman mill at Kawerau produces over 300,000 tonnes per year, enough for all NZ's newsprint and telephone directory requirements, plus around 25% of Australia’s newsprint needs. The balance of production is exported throughout Asia and the South Pacific. 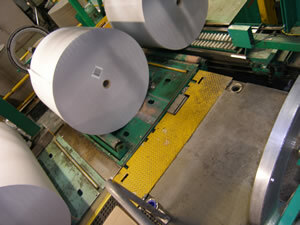 Paper is manufactured in wide rolls called webs and then slit while rewinding onto cardboard tubes called cores. These shorter rolls are sized specifically for printing presses. Keeping the roll balanced as it is rewound onto the core is a serious technical and control challenge. Excessive eccentricity - the distance between the core centre and the roll centre - can cause vibration and web breaks on customer printing presses, some of which operate at up to 85,000 print copies per hour! 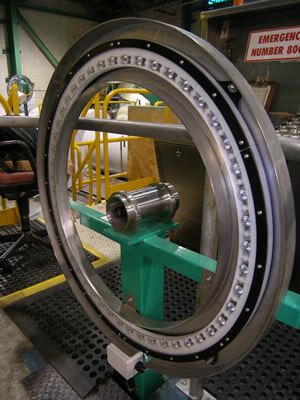 Norske Skog was using a manual measurement technique for detecting rolls with excessive Off Centre Core (OCC). This procedure was both time-consuming and subjective, with different operators achieving different results. ControlVision were approached to provide an automated inspection solution. Limited space on the production line meant cameras and lighting needed to be mounted within 2m of the roll surface. The imaging solution is based on PixeLINK 6Mpx cameras and Fujinon lenses. Safety concerns prevented the use of standard lighting for fear of distracting operators working around the area, so large diameter infrared ringlights from Spectrum Illumination, each comprising 48x1W LEDs, solved this challenge. Ask any machine vision specialist about technical tips for gauging with machine vision. They'll mention backlighting to enhance edge definition and point to long (or telecentric) optics to eliminate scaling effects. This application flew in the face of all gauging conventions! Backlighting was not practical - front-lighting the only practical choice. The result was softer edges with limited edge definition. The wide angle optics meant extensive optic distortion and exaggerated scaling effects. Even slight variation in camera to paper-roll position for the same roll size result in large differences in the apparent size of a roll in the image. .
Cognex VisionPro edge-based vision tools find the centres of the roll and core. The calculated distance between these centres becomes the Off Centre Core measurement. This application was made feasible by the sophisticated vision tool set provided with VisionPro®, Cognex's PC-based vision suite. VisionPro has advanced tools for image calibration, pattern matching and edge finding for even low contrast edges. Combined with ControlVision's VisionServer™ deployment environment, this application was developed and installed without the need to develop custom software.